A Call from the West--The Call of the Catholic Church in the West--The Response of the East--The Specific Object of the Catholic Church Extension Society. The Catholic Church Extension Society in Canada--Its Principles and Policy. The Ruthenian Problem--A Religious and National Problem--Its Phases--Its Solution. The necessity of a Field Secretary for the Organization of our Missionary Activities. The Church Union Movement; its Causes and Various Manifestations--The Protestant and Catholic View-point. The Apostolate to non-Catholics; its Obligation--What have we Done?--What Can we Do? Obstacles that Impede. . . . Circumstances that Help the Work of the Church in Western Canada. A Moral Reason--A Social Reason--A Political Reason--A National Reason--A British Reason--A Religious Reason . . . for our \"Separate Schools.\"
A Crusade for Better Schools in Saskatchewan: Its History--Its Lessons--An Invitation and a Warning. Principle on which should be Based the Division of Company-taxes between Public and Separate Schools. Higher Education in Western Canada--Duty of the Hour--University Training, Condition of Genuine leadership--For Catholics Higher Education means Higher Catholic Education--The Concerted Action of all Catholics in Western Canada can make a Western Catholic University a Reality. After-war Problems from a Catholic view-point--Reconstruction--The Duty of the Hour. Public Opinion and the Catholic Church--What is Public Opinion--Its Power--How it is Formed--The Catholic Church in its Relation to Public Opinion--Our Duties to Public Opinion. Facts--Principles--Policy of the Catholic Truth Society--Its Value for the Church in Western Canada. Importance of the Catholic Press--Requisites for its Success in the West. Immigration--Are we Ready for it?--Outline of a Plan of Action. A Catholic Congress of the Western Provinces, the Ultimate Solution of all their Problems--What is a Congress?--Its Utility--Its Necessity--Tentative Programme of a General Congress. A Thought-compelling and Illuminating Article, by L. P. Edwards, in \"New York Times,\" on Problems that Confront Canada also. By Glenn Frank in the \"Century,\" June, 1920. By Rev. D. P. Tighe, \"Detroit News,\" Aug. 24, 1919. 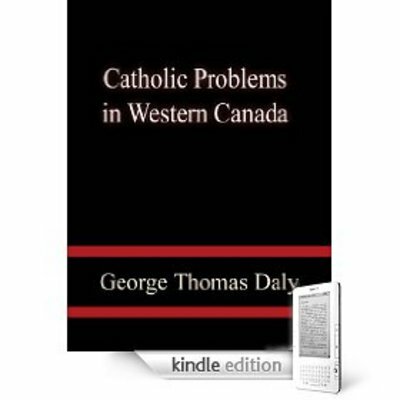 Catholic Problems in Western Canada catholic problems;western canada 9371553 4.99 thinkers Fresh Download Available!